I know many of you have had freezing temps, snow, and plain ugly weather. Here in the Upstate of South Carolina this winter has been really mild. Fragrant blooms in the garden are continuing to shine, so without further adieu, here is my presentation of February's fragrant blooms. I have two Daphnes, both were the small size when I bought them....now the one in the top photo is about a third larger than the one in the second photo. This witch hazel is a new plant, only about 24 inches or so tall. Can't wait for future years to have a nice large clove-y fragrant shrub along the driveway. Now for some photos of last month's bloom -- it is growing more and more fragrant as more of these little tubular blossoms open. Oh how I wish there was Smell-O-Vision. I love this plant so much I bought another for an area by the front door in a large container. The front door has a small alcove, the fragrance greets you as you go in or out....heavenly. And finally, some of my Hyacinths are starting to bloom. In one area the Hyacinths have multiplied to a nice clump, can't wait for them to bloom! What do you have blooming on February 1st? This time of year there are some gardening days and some days to stay in and enjoy a warm fire. Since we moved here in the summer of 2010 I have been buying plants from the Abbeville Extension Office. Here is 2012 The order is due in November and usually is delivered in mid-December. This year the weather has been so warm that the plants didn't go dormant on the usual schedule. The delivery date was pushed back to mid-January. This year I ordered two crabapples, one Malus 'Red Silver' and one M. 'Golden Hornet'. Both are semi-weeping. The Red Silver has bronzy purple leaves and wine red flowers and purple red fruit while the Golden Hornet has white flowers with yellow fruit and green leaves. Apparently I also ordered two Spirea x vanhouttei. I forgot I had added those to the order form...think I did it on our way over to turn in the order form. I couldn't remember where I had planned on planting the spirea. Oh well, we gardeners love a challenge don't we? The flowering crabapples were to be planted up by the street along the front of the woods. In early November I was emptying out one of my worm bins and used some of the castings in the predetermined spots for my future crabs. To remind myself where I had worked the soil and added the worm castings, I got a big stick and stuck it in the ground when the amending was done. Yes, in the photo below is my stick. The neighbors wondered if I was "planting" sticks....oh that crazy Janet. The holes were pretty easy to dig in January after my earlier preparation. The spirea found a spot along the driveway and in front of the woods. Not bad for a quick planting day!! My newly planted tree is just above the 'h' in my web link on the picture. With hope and a little water (and no deer) I will be sharing some nice flower photos in the spring. And a little fun-- when finally taking down my Christmas wreath I found there were about five anole hiding in the browning greenery. They were just about as startled as I was! Some were really tiny and their colors ranged from brown to green. When I shooed away all the anoles, I was able to take down the wreath and remove the dead branches, save the decoration and put it away for another year. These little guys live in and around the stones on the front of our house. You can tell it is a warm day if the anoles emerge. These are the yellow paperwhites, Narcissus 'Grand Soleil d'Or'. I planted 50 of them in the septic field across the street from the house. The plan was to disperse them mid-way through the half acre. Bad idea. These are sweet little blooms, blooming in December/ January. Since this is the septic field we bushhog the field in the late fall, after the first frost. Well, the first frost is also when these little blooms are about 12 to 18 inches tall. That is not a good time to cut the field. Luckily they were not damaged from the cutting...but I didn't want to worry each year, so I dug them up and moved them last week. I planted them along the edge of the driveway, so you could see and enjoy them. See how tiny they are? The Edgeworthia chrysantha is still going strong, and will for another month and a half at least. Also growing in the backyard is a lot of moss. Moss is really an interesting plant and very pretty. Next time you see some moss growing, give it a closer look. Also continuing to bloom is the Hamamelis vernalis, Ozark Witch hazel. What a great plant!! A new addition to my garden is a Candytuft, Iberis sempervirens 'Purity'. I had other Candytufts, but just two and wanted to get a third. The one I bought was blooming already!! I wonder if it will continue to bloom all through the season? Now for your bird fix-- first a couple Goldfinches..one with more of its summer coloring than the other. The first time I saw this next bird, I thought it was a mutant Robin. It is about the same size, same colors, but very different. Turned out to be an Eastern Towhee. We rarely see them unless we are outside as they are ground feeders. This one was scratching around in the leaves in the next lot until I walked along the side of the house. This male Towhee flew up to a branch to keep an eye on me. Don't forget the Great Backyard Bird Count on February 15- 18th weekend. You keeping an eye on your birds? Wanted to share some 'after the rain' information. Some of you had asked about reporting to CoCoRaHS and your work schedule conflicting. I went back and reread the 'Getting Started' info. Here is where my selective memory kicked in, you can report BEFORE 7 AM. I must have blocked that part out. You can report the reading anywhere from 5 AM - 9AM for it to be recorded on the map. (So you early birds can get it done bright and early) If you report by 7 AM the amounts will be included in local weather report totals for the news. Reports by 9 AM will be shown on the maps. For those who might be away for a few days you also have the option of reports a multiple day accumulation of precipitation. 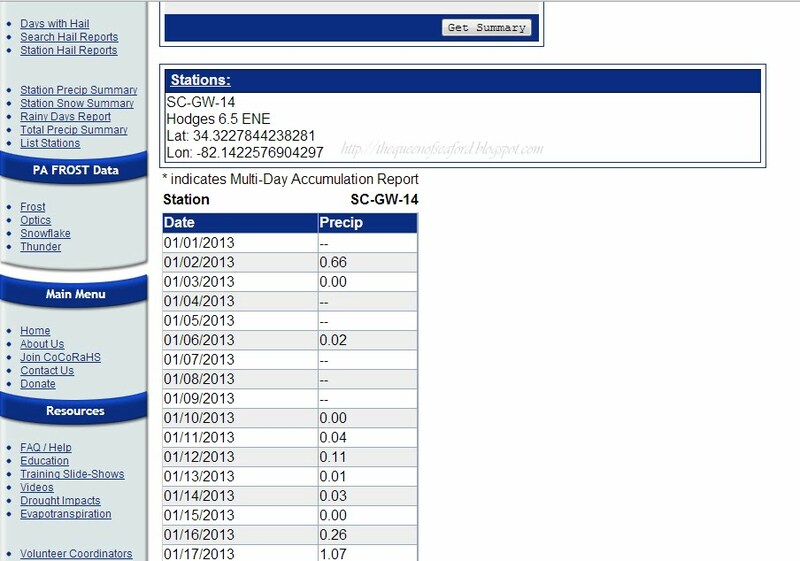 Our rainfall total for the rain from two days ago was less than I thought. My rainfall total was 1.66 inches. Further north, Greenville to Asheville and further west got a lot more... averaging about 3 inches. Rainfall in Greenville affects us. The lake levels have been crazy. Here is a picture of our dock before it rained on the 15th. Lots and lots of shoreline. This is typical in the winter. Our lake management brings the lake level down in the winter for the health of the lake. The winter's lake level also allows us to clean up trash, repair docks, and explore the shoreline. By sea level elevation the winter's low is supposed to be 434.5 feet above sea level. The photo above is 434.5 ft. Beginning January 31st the lake level is brought back up, slowly to what they call full pool, 439 feet. Here is the lake yesterday-- at 437 ft.
Today the lake level is another foot higher!! So rainfall upstream was enough to raise the level of the lake by three and a half feet! We know the exact level because of the US Geological Survey website. 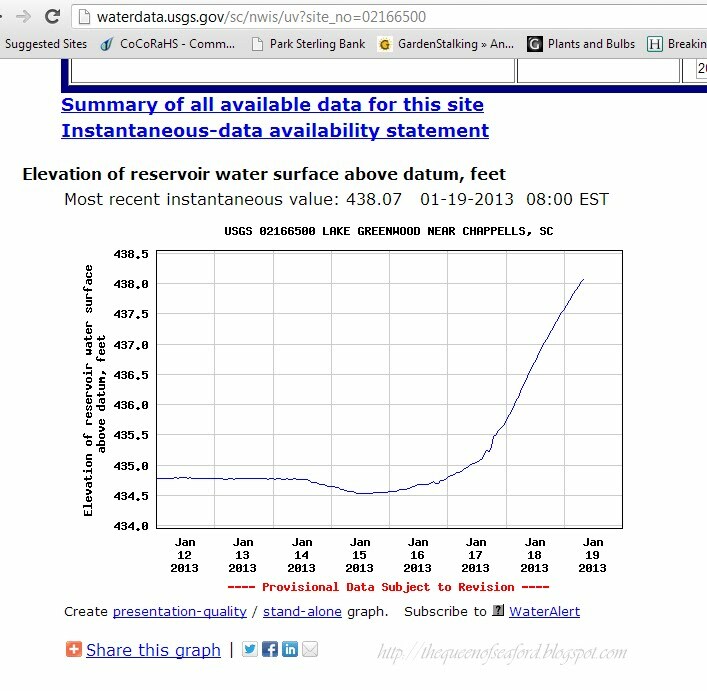 Check out the rise in water level in just a couple days!! 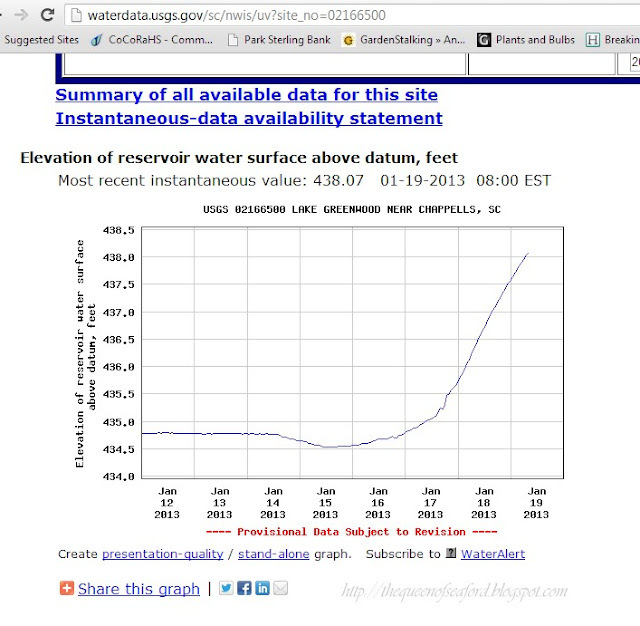 Not sure if they will lower the level much between now and January 31 when the level is supposed to come back up. If it wasn't so cold we might be tempted to uncover the boat and go for a ride. Was outside walking the yard and thought I would share an additional picture of the water.....water is real muddy but also quite high. 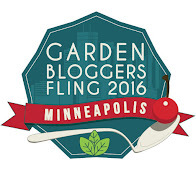 This past fall one of my fellow Master Gardeners, Ann, asked if I wanted to record rainfall. Well, being the gardener that I am, I said that I already measured rainfall and kept track on the calendar function of my Google account. She was talking about a volunteer group where you record your rainfall online. I said, "Sure!". This organization wants you to use a specific rain gauge, so if I was to join forces with this group I needed to buy said rain gauge. This organization is CoCoRaHS, Community Collaborative Rain, Hail, & Snow Network. 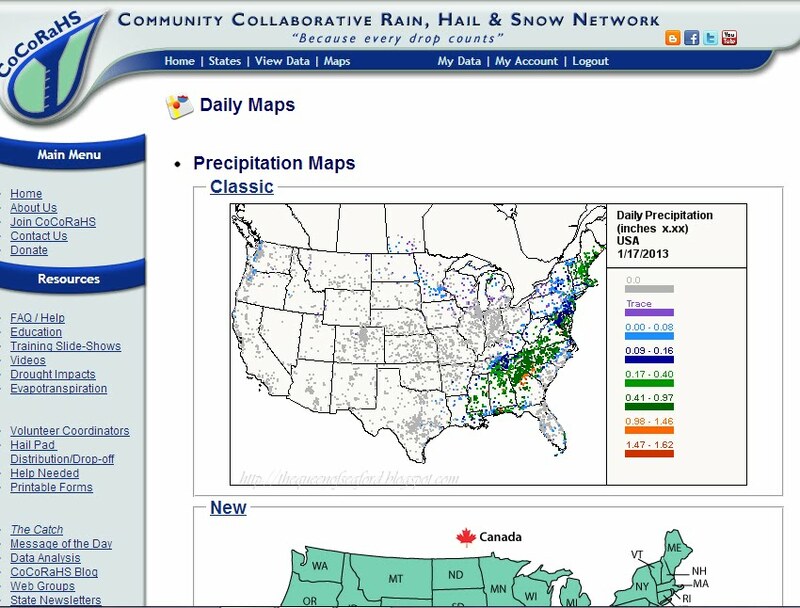 CoCoRaHS is a non-profit citizen based organization of folks across the country who keep track of precipitation and report it to their data log page on the CoCoRaHS website. The only cost in joining is the rain gauge. You send in your address and tell them where on your property you are going to place the gauge....roughly place it. You will receive a password and a station number and your location coordinates. It is important to make sure you are away from structures (house) and trees. During the winter placing ours in the middle of the yard wouldn't be an issue, but in the summer it would be a bother to remove it every time you needed to move or when the irrigation system came on. 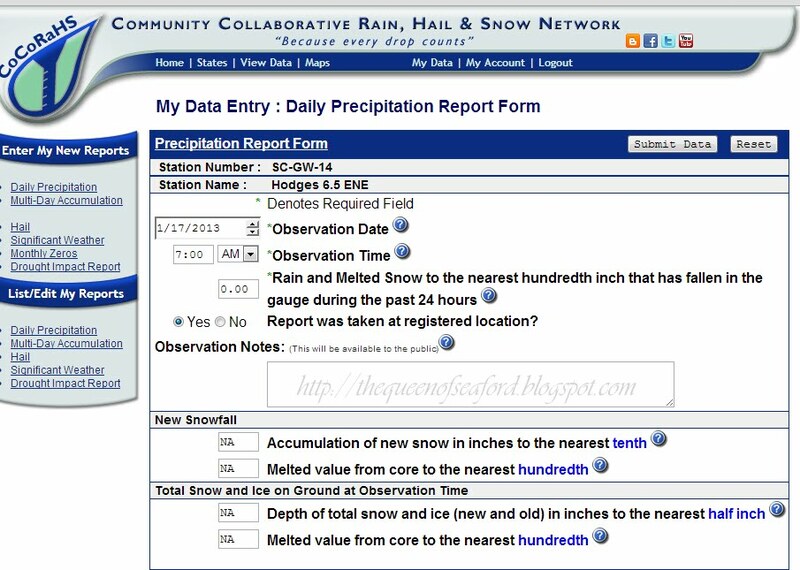 The data that is collected is used by National Weather Service, emergency services organizations, USDA, city utilities, teachers and students, hydrologists, and many others. It is nice to be a part of a much bigger volunteer group. You can read more about it on their site. We didn't want to have our rain gauge mounted on a 4x4 -- too big, so our idea was to mount a board on a fence stake and attach the rain gauge on that. Seems to work. It is important to make sure the gauge is level. We do have a large area across the street that we could place it, but the reporting time window is between 7 AM and 9 AM. Hi, my name is Janet and I don't get up that early. I am lucky to get my rainfall amount by 9 AM, certainly don't want to have to go up to the street in my jammies to read the gauge. So here it sits, along our driveway...easy to reach and empty. The rain gauge has a cylinder inside the outer container. The cylinder is marked with 1/100th of an inch increments. The inner cylinder holds one inch. When we have rain like today -- well over an inch-- it overflows into the outer container. To read the measurement you take the inner cylinder out of the container and read the inner cylinder's water height. If there is overflow into the outer container OR the water level is above your one inch line, pour it all into the outer container. Then fill to the one inch measurement into the cylinder, pour it out, repeat until all the water is gone from the outer container. The large outer container can hold up to eleven inches of rain, hopefully we don't get more than that in one 24 hour period! After taking the measurement, you log onto your account and go to your data page. The date is already on the form, you just add the time and the amount of recorded rainfall. Hit submit data and you are done for the day. 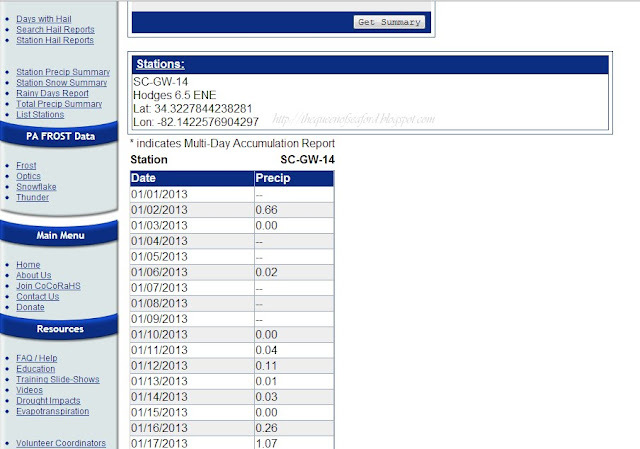 From this form I like to go to the maps to see how varied the rainfall is in my area. I am in Greenwood county, along the northern border of Greenwood and Laurens counties. Are you a rainfall data recorder?? Do you want to be? 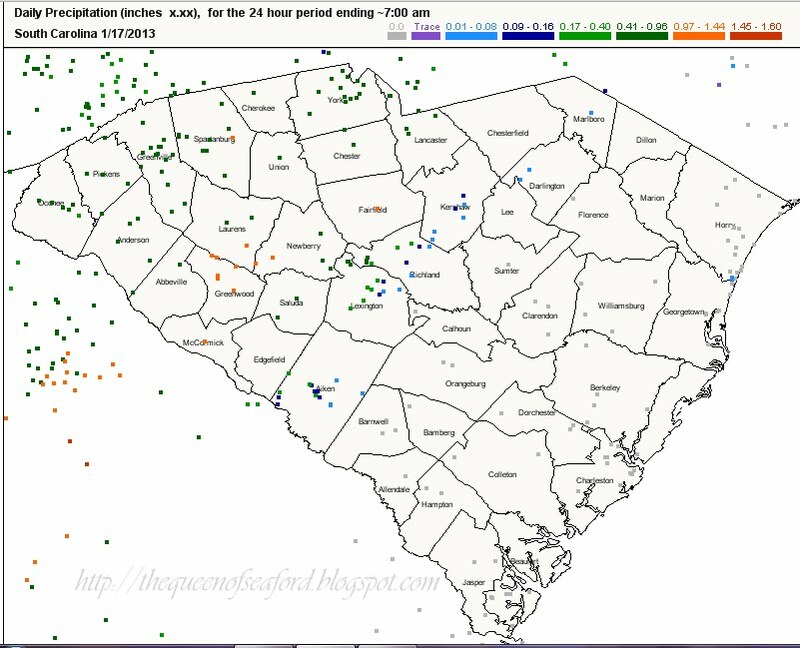 CoCoRaHS is always looking for more citizens to measure and record the precipitation in their area. You can see from my map that there are places where more observers are needed. Bird photo share time--- This is the little Brown-headed Nuthatch who was being so elusive last week. He stayed on the suet feeder for quite a while for a nice long photo shoot. He kept staring at me, I went to various windows to try and get a different angle. Stay tuned and I will report our rain total for today....it is raining really hard, has been for the last couple hours, since it got dark. Before it got dark I saw the cylinder was full, one inch of rain. I am guessing a couple inches by the morning. This winter has been so mild for those of us in the Upstate of SC. Today I was able to plant two crabapple trees, Malus 'Red Silver' and M. 'Golden Hornet' and two Spirea van houttei that I ordered in November. While working in the yard I was happy to see my Daphne odora 'aureomarginata' was starting to bloom. I thought I would walk around the yard and get a few photos of all that is blooming today. 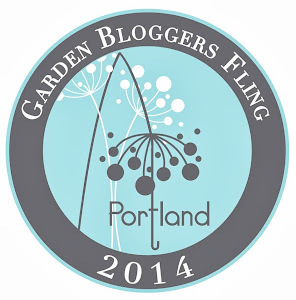 Carol from May Dreams Gardens has the Garden Bloggers Bloom Day each month on the 15th. 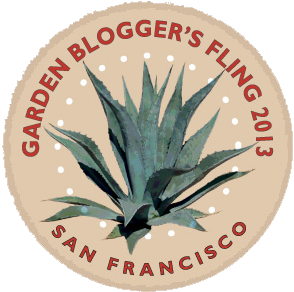 Be sure to check out what is blooming from other bloggers. 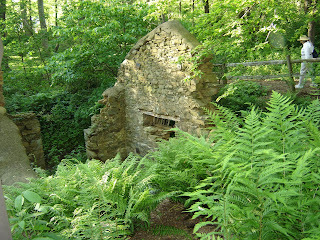 Drain field- see the Paperwhites? They are so small, will move them along the driveway soon. Camellia sasanqua 'Yuletide' has been blooming since October! See those orange bundles of pollen? My new garden art with blue bottles, adding a little color to the shady part of the garden. Thanks for joining me to see what is blooming in my garden.